Nothing says umami like the taste of wild mushrooms. If only I could stroll through the woods and confidently pick mushrooms that are tasty and safe to eat! Leaving this step to the experts, I forage happily at local farmers markets or a nearby grocery. A visit to the South of the James Market In Richmond last weekend yielded lovely specimens from two local growers : white and grey oyster mushrooms from amFOG(site under construction) and shiitakes and creminis from Steve Haas Mushrooms. 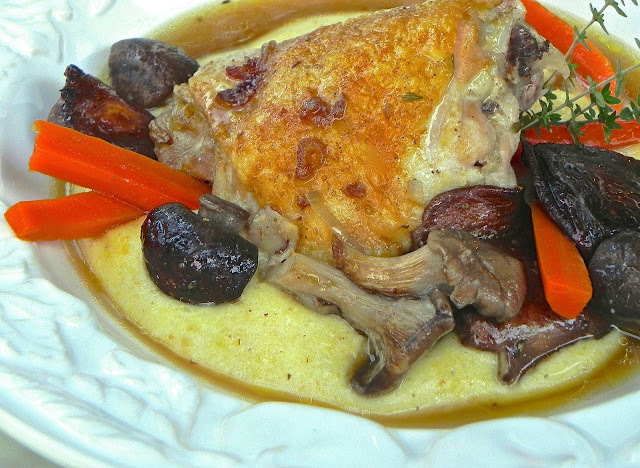 This entry was posted in autumn, gluten free, main courses, winter and tagged braised chicken, chicken and mushrooms recipes, chicken recipes on November 25, 2012 by Michele Humlan. This past week marked Virginia’s very first Cider Week. The apple cider lauded was hard cider, fermented to elevate alcohol content, placing it in the spirits category. There are currently six licensed cideries in Virginia and our local Ellwood Thompson’s Natural Market in Carytown carries all these golden brews. By spring we should see product from Blue Bee Cider in Richmond’s Old Manchester district. This entry was posted in autumn, desserts, vegan, vegetarian and tagged apple chips, apple cider sorbet recipes, chai spice apple cider sorbet recipes, sorbet recipes on November 16, 2012 by Michele Humlan. Daybreak Farm sits on 90 acres outside Richmond, Virginia in Chesterfield County. Fully operational since 2008, the farm is owned by the DiSavino Family and managed well by powerhouse Dawn DiSavino, who gave a recent tour with daughter Annmarie and son Howie. This family lives off the land – they eat what is grown and raised – and most of the power used to keep the farm running is solar. Large freestanding solar panels resembling sports bleachers are visible just beyond the main house. Currently there are goats for soapmaking , beehives which should produce honey by spring, a fledgling fruit orchard, a well stocked fish pond and over one hundred laying hens, guarded by three roosters. This entry was posted in breakfast recipes, gluten free, main courses, vegetarian and tagged breakfast tostadas, salsa recipes, tomato avocado salsa, tostada recipes on November 12, 2012 by Michele Humlan. Butternut squash is one of those foods with an intoxicating aroma and a flavor that is another thing entirely. This is not to say the taste disappoints, but one is deceived by the clean, clear scent of a freshly cut butternut into believing it will deliver the same punch to the palate. Other pleasantly deceptive foods are popcorn, fresh coffee grounds, cucumber and steak charred just right on the grill. The scent of these fills me with longing, nostalgia…. This entry was posted in autumn, gluten free, soup recipes, vegan, vegetarian and tagged apple cider recipes, butternut squash soup recipes, chipotle, vegan soup recipes on November 12, 2012 by Michele Humlan. There are two friends with whom I dine weekly. At dinner we announce “we are salad people”, meaning that most of our meals together include a nice salad. We like chopped salads, eaten with a big spoon, and fluffy salads eaten with a proper fork. 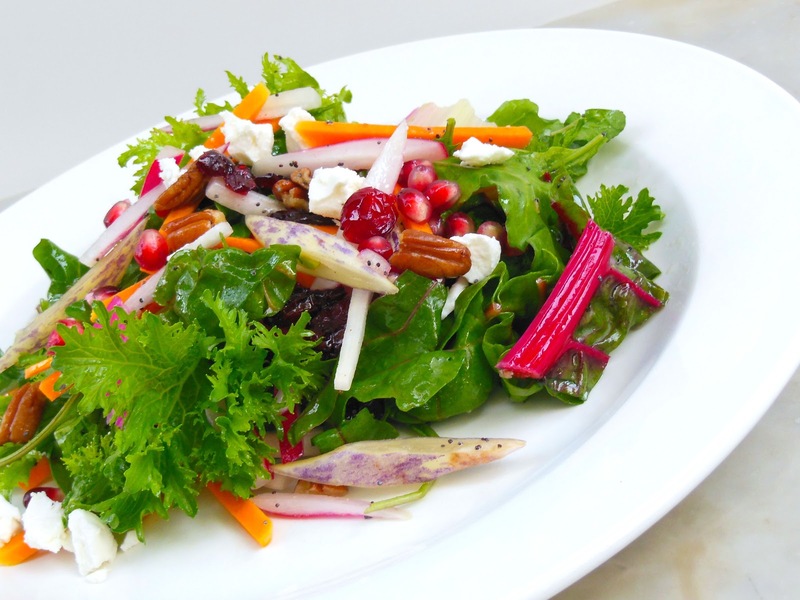 Generally served alongside the main course, our salads include myriad ingredients: bitter, sweet, salty, tangy, chewy and creamy. My friends live close to what is undoubtedly the best of Richmond’s many farmer’s markets, the South of the James Market at Forest Hill Park. A recent stroll through this Saturday morning market yielded inspiration for a fall harvest salad. This entry was posted in autumn, gluten free, salads, vegan, vegetarian and tagged butternut squash recipes, fall greens, pomegranate recipes, radish recipes, salads, vinaigrette recipes on November 12, 2012 by Michele Humlan. If I ruled the world, apples would be a seasonal commodity. Yes, I recognize the convenience of year round apple availability in grocery stores, but I want to miss them terribly when their season ends and welcome them back heartily when there is a chill in the air next fall. Absence would make any heart grow even fonder of this versatile fruit. My local farmer’s market carries a dozen or more varieties from late August until they close shop at Thanksgiving. This entry was posted in autumn, desserts and tagged apple cake recipes, apple recipes, gluten free cakes, vegan cakes on November 10, 2012 by Michele Humlan. The last of the tomatoes are on the vine. Time to rescue them before they fall victim to frosty nights. I have friends who swear that late season green tomatoes will eventually turn crimson if you patiently watch over them on your windowsill. This offers fleeting pleasure and tests patience. 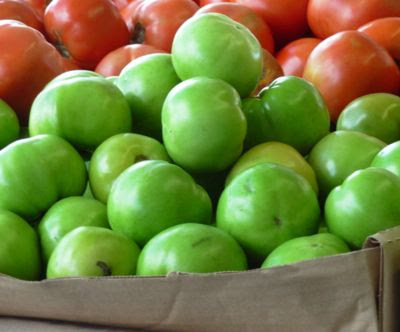 Why not enjoy green tomatoes throughout the cold weather months in the form of a spicy chutney? Green tomato chutney can be both down home and elegant, enlivening hot and cold appetizers, salad dressings and grilled meats and seafood. It makes a terrific sandwich spread, elevating simple cold cuts and cheeses to the sublime. When unexpected company arrives, you can impress with a snack of green tomato chutney, creamy cheese and a base of flatbread, crackers or slices of toasted baguette. This entry was posted in appetizers, autumn, condiments and tagged chutney recipes, condiment recipes, green tomato recipes on November 9, 2012 by Michele Humlan. End of summer means that field peas are in season. 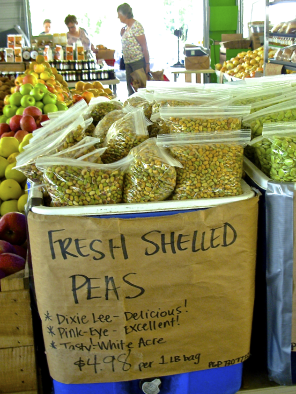 Sure, you could purchase frozen field peas, but nothing compares to the earthy taste and toothsome bite of those that are freshly shelled. You will pay a little more, but these are not mechanically separated from their shells; a labor intensive act of love has delivered these beauties to the market. Field peas are technically beans, not peas. They are cousins to the Asian Mung bean, traveling to the new world in colonial times with African slaves who recognized their value as drought resistant, nutrient rich, portable foods. This entry was posted in autumn, gluten free, main courses, salads, side dishes, vegan, vegetarian and tagged bean salad recipes, bean salads, field peas recipes, field peas salads, smoked hot Spanish paprika, smoked paprika on November 5, 2012 by Michele Humlan.